I don't know about anyone else's kids but mine aren't the biggest fans of tidying up. When I ask them to clean their rooms I get sighs all round and they think that pushing things to one side will give the illusion that everything is now clean. Us parents know better though don't we. 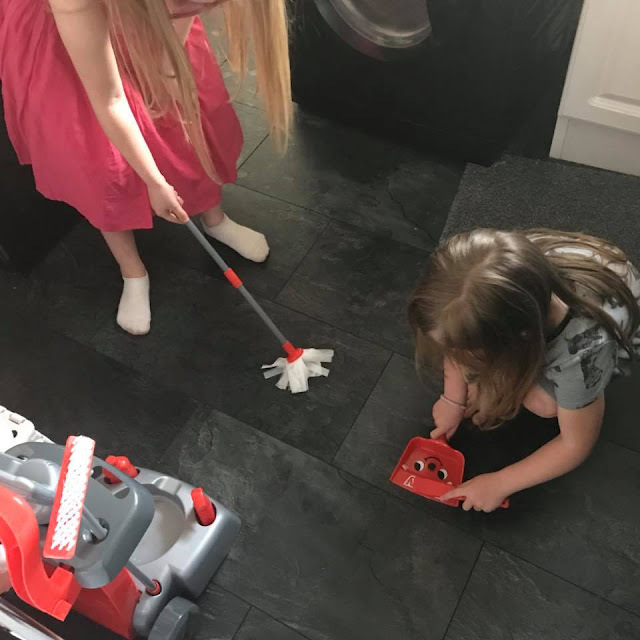 Surprisingly though, my five year old isn't like her older sisters and she quite enjoys helping me clean so when I was sent the Cason Deluxe Henry Hoover Cleaning Trolley I just knew this would become her new favourite toy. Would this mean that my dreams of having my own cleaner round the house were coming true? What do you get with the Deluxe Cleaning Trolley? 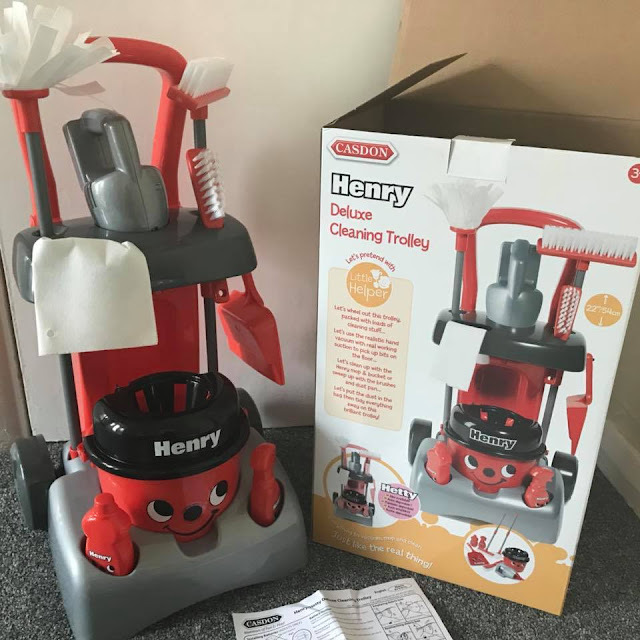 The trolley itself actually comes in two designs, the lovely Henry which we were sent and the just as cute Hetty. 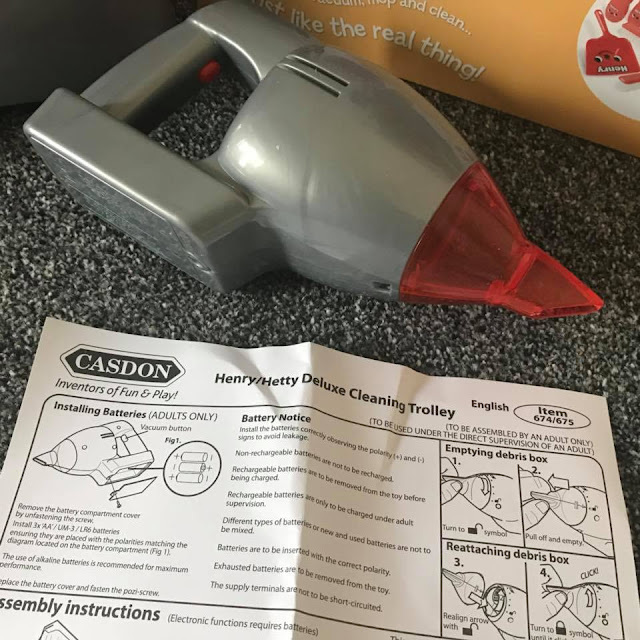 With both you receive the cleaning trolley which needs to be assembled (this takes mere minutes). 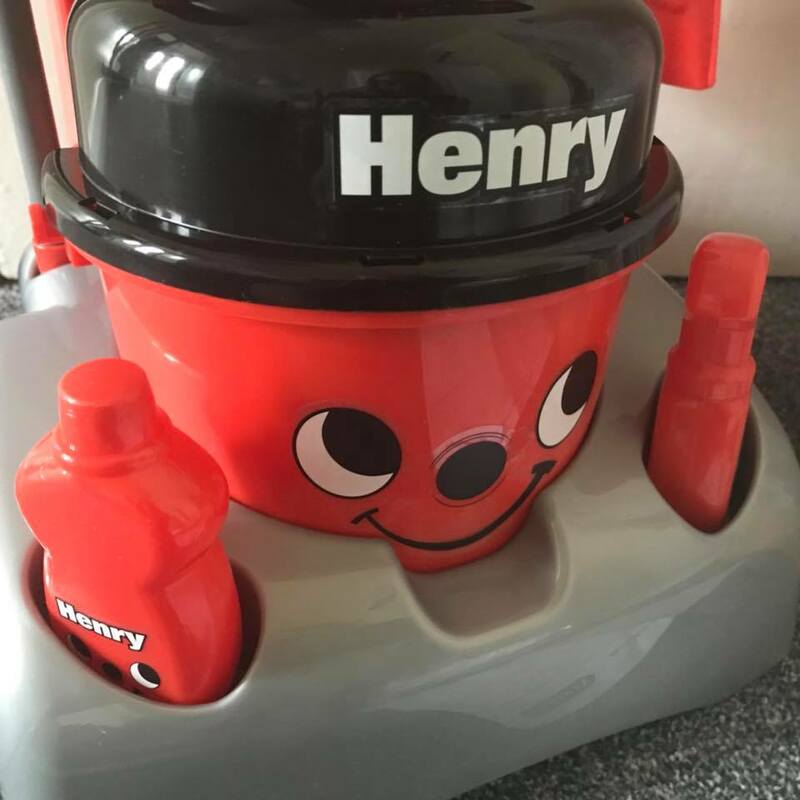 Also included is a battery operated hand vacuum with real suction (this requires 3 x AA batteries which aren't included), a mop and bucket with wringer, a tall sweeping brush, a dust pan and brush, two bottles, a cleaning cloth and paper bag for any stray debris or rubbish. Something else which I almost forgot to mention is that it comes complete with stickers that you or your child can stick on. How does the Deluxe Cleaning Trolley work? What I like instantly is that all the accessories either hang on the trolley or fit in dedicated slots, this makes the toy fairly compact. My youngest was instantly fascinated with the mop and immediately asked to fill the bucket with water and she began to soak my kitchen floor, I think something else that could have been included was a wet floor sign! What was funny to me was that her eight year old sister suddenly had the urge to clean too. A great feature is the hand held hoover, it really does work, sucking up tiny crumbs and it's the perfect size for little hands. Disappointingly the bottles that are included don't actually do anything. Now I like the fact that kids can use their imagination, I'm a big fan of pretend play hence liking this toy anyway but it would have been even better if the bottles could actually be filled up with liquid and had the spraying feature. This would have just added another element to the play. I know mine would have then also used this part in the bath. Where can I purchase the Deluxe Cleaning Trolley? It's a sturdy toy and you can always add your own cloths etc to it so worth the money you pay as it's something that will be played with for hours.